Can Get Real Piano make your MIDI files sound like they were played on an acoustic grand? There's no shortage of of high-quality acoustic piano plugins on the market, but if you're still struggling to get realistic-sounding results. you could try Get Real Piano. 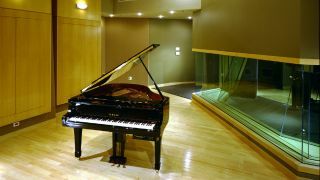 This website offers just one service: to take your MIDI piano tracks and generate a recorded performance on a Yamaha acoustic grand piano from them. The process goes like this: you upload your Standard MIDI File and the Get Real Piano team then load it into Digital Performer and play it back through a Yamaha Disklavier DC3Pro (a MIDI-capable acoustic grand piano). They then spend "the next few hours" tweaking MIDI velocity values by ear until the performance sounds spot on. "It makes a huge difference," says Edwin Dolinski, an accomplished classical pianist and founder of Get Real Piano. "By using our ears and pianistic intelligence in a patient and methodical manner, we can produce a more believable and musical result than has ever been offered before using this technology." After this process has been completed, the performance is recorded in real-time using a matched pair of Neumann KM184 microphones, a Millennia HV-3C stereo preamp and a MOTU 896 digital interface. A third microphone - a modified Apex 460 large diaphragm tube condenser - simultaneously records the sound under the piano; this captures a darker sound that's sometimes used to add more punch. The completed mix is then sent back to the customer. Obviously, this service is only going to be of interest if you really care about your piano performance and it's not going to be buried in a mix - particularly as the flat rate cost is $200 per piece (you'll be informed before work starts if it's going to cost more than this). If that's you, though, head on over to Get Real Piano to find out more.